FROM BASIC TO ADVANCED ROUTINES The thumb tip is a gimmick overlooked from the Magician because it is used almost always in the same way, already known to a lot of people. 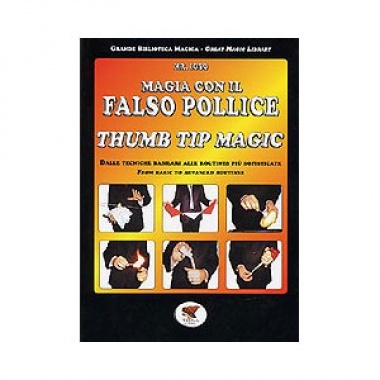 This book and the video "Thumb tip Magic Techniques", are thought and realized to introduce the Magician to the potential and to study in depth the use of the thumb tip to everyone interested, starting from the basic method (good for the beginner), and explaining others, often hidden. Reading this book, you will discover that you need very few to change the thumb tip in a letal weapon to amuse the audience and to find something to do also in the situation more unexpected. You will find a lot of routines from the classics to the unknown (Bank Night, Rings Throwing, Twentieth Century Silk, Cut Rope or Ribbon Restored and a lot more). A lot of ideas let you able to use the TT in close-up magic and the author lay emphasis on the presentation of the effect. So the book is particularly good for the beginners that want to have good foundations. You will found a lot of very clear and at close range colour pictures. These make the book unique and very good also for the experienced Magic artist. - Written in two languages: English and Italian.